The updated rules and regulation are now available - they now inclue a section on common external additions. Any non emergency repair request must be made in writing to Community Focus NC and be presented at a monthly meeting for board vote and approval. 4100 Five Oaks is a community of 58 town homes located in the southwestern portion of the city and county of Durham, North Carolina. We're one of the four members of the Five Oaks community: 4100 Five Oaks (us), Five Oaks Lakeside, Farrington Townhomes, and Hickory Downs. 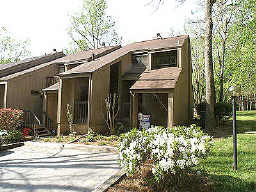 4100 Five Oaks is approximately seven miles to Duke University and seven miles to the University of North Carolina at Chapel Hill. Raleigh/Durham International Airport is fifteen minutes away via I-40 and the city of Raleigh is a short twenty minute drive away. The neighborhood is serviced by the Durham Area Transit Authority Bus Service (DATA) and by Triangle Transit Authority Bus Service (TTA). Stylistically, the neighborhood is constructed in the 1970’s contemporary design. Individual town houses are characterized by an abundance of sliding glass doors, decking, balconies, dramatic vaulted foyers, high lights and open living spaces. An additional characteristic of the neighborhood is that it is heavily wooded. A majority of the units back up to a well landscaped courtyard or to wooded common area. The association annually assesses each owner for their portion of hazard insurance. This fee is calculated on individual units square footage. Currently monthly home owner’s dues are $171 per month, this fee covers exterior siding maintenance, roofing maintenance, landscaping, area lighting, mail box kiosk maintenance and driveway maintenance. Additionally, each owner pays their pro-rata share of the annual insurance assessment for the association. Owners within the 4100 Five Oaks Community are required to join the Five Oaks Recreational Association as per the covenants.